It can be argued that there are more choirs in the United States than any other type of ensemble. Given that there are no instruments or specialized equipment required, a chorus is easier and less expensive to develop than a band or orchestra. Additionally, singing is an innate capability in most humans. While the highest levels of a singing career require extensive training, it is possible for an amateur singer to perform well with only limited instruction. Choral groups need qualified and dedicated leaders. There are a variety of environments where a choral conducting career can be established. The most obvious path for a choral conductor is a position in an educational institution. The vast majority of K-12 schools and colleges and universities offer students the chance to sing in various choirs. 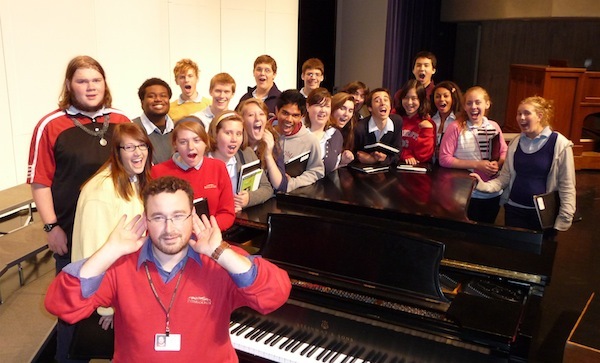 Choral conductors serving in an educational institution have the opportunity to work with a wide variety of ensembles. From groups of fledgling singers learning the fundamentals, to doctoral candidates who rival the world’s best professional choirs, the work of choral teachers spans the entire educational horizon. And the variety of literature sung by choirs in our schools, colleges and universities covers the entire 1,500-year history of the choral spectrum, leaving no musical stone unturned. Choral conductors serving in an educational environment work long hours, and do so with an altruistic zeal that verges on the evangelical. 75-hour weeks during the academic year are common. Off-campus performances, competitions, and additional rehearsals are expected. Most choral directors in educational environments invest time on the weekends, and do so willingly, because they know they are serving a much greater good through their efforts. 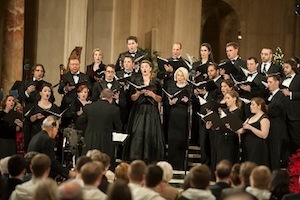 The choral art owes its very existence to the the realm of sacred music. Judaic and early Christian traditions used various forms of chant as a central part of the worship experience. Early chant repertoire constituted the seeds that eventually grew into the western choral art form. Though sources disagree on exact numbers, most generally concur that there are well over a half million Christian and Judaic houses of worship in the U.S. alone. With virtually all of these offering some form of vocal music program, there are ample opportunities to serve in a paid capacity in a church or synagogue. Relgious-based choral positions vary wildly, from the part-time choral conductor leading a small choir in a rural church, to the music director at a cathedral overseeing a large music staff and multiple ensembles. The salary range in religious institutions is just as diverse. While the fledgling student conductor working their first job may earn only enough to cover the cost of gas, full-time salaries for the combined organist/choirmaster position in large churches reach into the six-figure range. Obviously, a position in a house of worship will obligate the choral director to take part in scheduled weekend worship services. Those in full-time positions have an adjusted “weekend” during the week. Most symphony orchestras include at least one concert each season that features a representative work from the choral-orchestral repertoire. The music director will often seek a choral conductor to prepare the vocal ensemble. Though this is not usually a steady job, it can provide the creative choral musician with an annual opportunity to conduct important literature. Many choral conductors who work part-time with symphony orchestras also serve as the orchestra’s associate conductor, complete with the opportunity to conduct an occasional subscription concert. In most communities in the U.S., adult choral ensembles come together on a regular basis simply to rehearse and share the joy of performance. Generally known as community choruses, they range from small groups in a local retirement villa, to large ensembles singing barbershop literature, to enormous community programs with multiple ensembles and full-time staffs. Most operas and works in the musical theatre genre feature numerous choral selections. These “crowd scenes” are vital to the advancement of the plot, and are frequently the grand show-stoppers of the performance. Preparing the large chorus numbers in musical theatre requires a choral leader well-versed in the vocal pedagogy and in mechanics of ensemble singing. Due to the primacy of the voice in the form, the music director of such a production is often likely to be a choral conductor. This requires a combination of musicianship, vocal acumen, conducting skill, and a willingness to work collaboratively with other artists. Whether they are small, local amusement parks or the Disney megalopolis, most theme parks offer some form of live entertainment, often in the form of a musical review. The vocal nature of these events necessitates the special skills of a choral conductor. In much the same way as a musical theatre production, the choral conductor will be called upon to coach individual singers, lead large choral production numbers, and work in a demanding environment of multiple daily performances under challenging conditions. Dr. Scott W. Dorsey was director of education at the American Choral Directors Association. His received his DMA in Choral Conducting from the University of Iowa, an MA in Choral Conducting from California State University-Stanislaus, and a BA in Voice from Nebraska Wesleyan University. Scott has led choral programs at several colleges and universities in the U.S.
A graduate degree is not an absolute requirement for a career in choral conducting. 1. Most public schools do require their faculty to engage in continuing education. Those expectations vary wildly from one school system to the next. Some require faculty to earn 15 credits past the bachelor’s degree within a certain number of years. Others may expect them to eventually earn a master’s degree. Graduate education typically leads to higher salaries. 2. A graduate degree is required for a conducting position in higher education. Most universities requiring the PhD or DMA, depending upon the specifics of the position. An established track record of teaching excellence and academic (publishing) success is also necessary. Competition for these positions is fierce. Long hours, including many nights and weekends. Working for administrators who are at best apathetic about the arts. And I want to enter this field because . . . ? Simple. The ethereally tangible payoffs for the choral conductor are the people and the art. There is nothing in the world like taking a room full of strangers and, over the course of a concert preparation period, helping them blend into a single unit. What began on the first day of the semester as a gaggle of giggling teens will be systematically transformed into a choir that strides upon the stage with confidence, poise, and a readiness to share great works of art. The members of the audience will see their sons and daughters in a new light, and view in them the noblest part of their hearts and minds. They may even catch a glimpse of their child’s future self on that stage. In a choral environment you will see these people at their very best as they strive together toward a mutual goal. Not a goal of financial gain, but one that is rooted in the pursuit of beauty for the sake of beauty itself. Then there is the art. It’s easy to listen to a piece of music on one’s digital device. It’s an entirely different matter to work cooperatively with others to recreate that work of art in real time, where live performance exists. Through that pursuit of artistic beauty, humans are changed for the better. We have seen it many times, and have stood in awe at the transformative power of the choral art. The tough guy finds a tear in his eye as he ponders the words of Byron set to music. The young woman afraid to make decisions without her friends finds empowerment by earning a solo. The painfully shy student discovers a power and strength she never knew existed in herself. The young man discovers his own personal courage within the risk of artistic vulnerability. You, the choral conductor, will enhance the lives of your singers, leaving a positive mark on them that will follow them forever. All of that, and so very much more, you will give freely to your charges through your efforts, your care, your passion for the art, and your unwavering belief that in them resides more than they ever thought possible. It has been my experience that we in the choral profession are some of the richest people on earth. Not by any financial measure, but in the impact we have upon the humans with whom we make music. ACDA is a non-profit organization that fosters and promotes the performance, composition, publication, research and teaching of choral music. ACDA members are choral directors in public and private K-12 schools, community choruses, colleges and universities, and houses of worship. Each state in the U.S. has an ACDA chapter. ChoralNet is a professional networking site for choral music provided by ACDA.